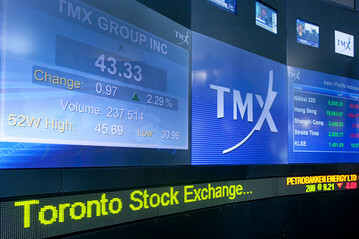 TORONTO, May 25 Canada's main stock index dipped on Thursday as a plunge in oil prices weighed on energy shares, offsetting gains for industrials and financials after quarterly earnings from some major banks impressed investors. U.S. crude prices settled $2.46 lower at $48.90 a barrel after the Organization of the Petroleum Exporting Countries' decision to extend production curbs fell short of expectations of deeper or longer cuts. "Regardless of what OPEC does, U.S. shale producers can produce at these prices or lower, so that is going to continue to put an upward cap on the energy price," said Mike Archibald, associate portfolio manager at AGF Investments. Canadian Natural Resources Ltd fell 2.0 percent to C$40.21, while the overall energy group tumbled 2.5 percent. The group has lost nearly 18 percent since posting a 19-month high in December. The sector is cheap but needs a more sustainable upswing in the price of oil to attract investors, particularly U.S. money managers, Archibald said. The Toronto Stock Exchange's S&P/TSX composite index closed down 8.76 points, or 0.06 percent, at 15,410.73. Just three of the index's 10 main groups ended lower. Industrials rose 1.2 percent as railroad stocks climbed, while the financials group, which accounts for a third of the index's weight, gained 0.3 percent. The country's biggest bank, Royal Bank of Canada, rose 0.8 percent to C$93.74 after reporting an 11 percent profit increase, beating market forecasts, on strong performances in its capital markets and wealth management businesses. Canada's second-largest lender, Toronto-Dominion Bank , was up 1.5 percent at C$64.01. Its earnings also exceeded expectations, helped by a strong performance at its retail and investment banking businesses. But No. 5 bank Canadian Imperial Bank of Commerce fell 1.0 percent to C$105.24 after reporting a softer beat than its two larger peers. "What you are seeing out of the broader bank reports in the last couple of days is that loan loss provisions continue to be in a solid position," said Archibald. Manulife Financial Corp, Canada's biggest life insurer, was up 0.6 percent at C$23.69 after it named Roy Gori, an executive from its Asia division, to replace the retiring Donald Guloien as chief executive officer.